As of Summer 2018, adjustments to the San Juan County Parcel Database (see the tab The Devil is in the Details) have been made to exclude all parcels that cannot have additional development due to conservation easements, along with excluding all “exempt” parcels that describe land (like parks) that will never be developed. In addition, adjustments have been made in the definition of what constitutes a “developed” parcel v. an “undeveloped” parcel; these adjustments have increased the number of “undeveloped” parcels and therefore increased the “development potential” (read: maximum size or growth of population) of the county. Details regarding the current status on rural lands growth potential are available in a public email sent to relevant county agencies. 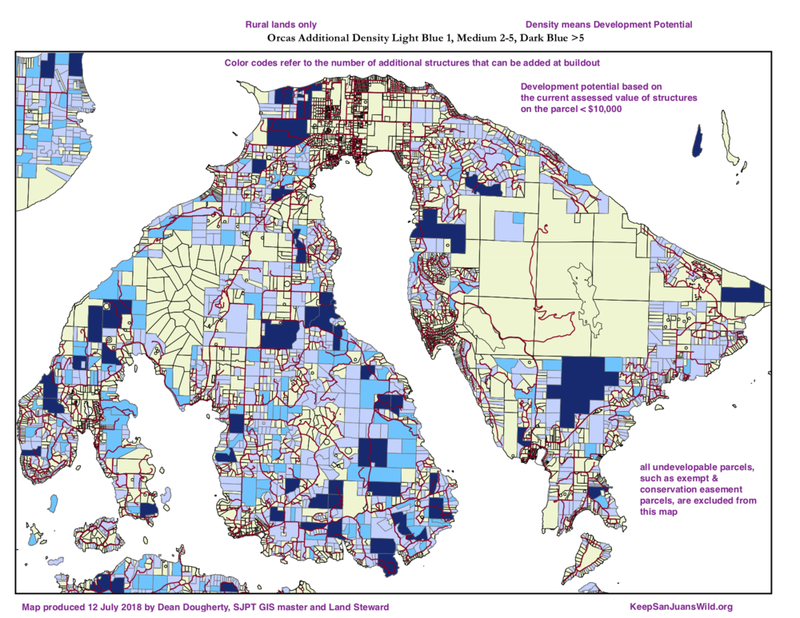 (The adjustments regarding development potential are not reflected in the maps shown below; the maps, made in July 2018 prior to the re-calibration of what is considered an “undeveloped” parcel, under-represent the actual development potential). Not counting visitors, and with yet-to-be-fully-calibrated development potential in activity centers, the first approximation buildout population for San Juan County exceeds 80,000 people. By reference the current (2018) estimated population of the county is 16,000, and the estimated county population growth for the 20 year planning period (ending in 2036) is 3000, resulting in an estimated total county residential population of ~19,000 in 2036. Given there are no restrictions on actual population growth or on the growth of the visitor population, what actually happens (which is to say: the decisions of the market) will prevail over whatever the plan might forecast. Note also that the visitor population during the expanding summer season matches or exceeds the local residential population, so the figures shown here would be expected to double during the peak season. Thumbnails of the county and Orcas maps are shown below. Click on the map title to get the full resolution map.